Calaveras Big Trees State Park, a preserve of Giant Sequoia trees, is in the county several miles east of the town of Arnold on State Highway 4. Credit for the discovery of giant sequoias here is given to Augustus T. Dowd, a trapper who made the discovery in 1852 while tracking a bear. When the bark from the "Discovery Tree" was removed and taken on a tour around the world, the trees became a worldwide sensation and one of the county's first tourist attractions. The uncommon gold telluride mineral calaverite was discovered in the county in 1861 and is named for it. Mark Twain set his story, "The Celebrated Jumping Frog of Calaveras County", in the county. The county hosts an annual fair and Jumping Frog Jubilee, featuring a frog-jumping contest, to celebrate the association with Twain's story. Each year's winner is commemorated with a brass plaque mounted in the sidewalk of downtown Historic Angels Camp and this feature is known as the Frog Hop of Fame. In 2015, Calaveras County had the highest rate of suicide deaths in the United States, with 49.1 suicides per 100,000 people. The Spanish word calaveras means "skulls." 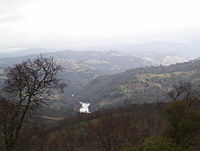 The county takes its name from the Calaveras River; it was said to have been named by Spanish explorer Gabriel Moraga, during his 1806–1808 expeditions, when he found many skulls of Native Americans along the banks of the stream. He believed they had either died of famine or been killed in tribal conflicts over hunting and fishing grounds. A more likely cause was a European epidemic disease, acquired from interacting with other tribes near the Missions on the coast. The Stanislaus River, which forms the southern boundary, is named for Estanislao, a Lakisamni Yokut who escaped from Mission San Jose in the late 1830s. He is reported to have raised a small group of men with crude weapons, hiding in the foothills when the Mexicans attacked. The natives were quickly decimated by Mexican gunfire. In 1836, John Marsh, Jose Noriega, and a party of men, went exploring in Northern California. They made camp along a river bed in the evening, and when they woke up the next morning, discovered that they had camped in the midst of a great quantity of skulls and bones. They also gave the river the appropriate name: Calaveras. The writer Mark Twain spent 88 seminal days in the county, during which time he heard the story that became The Celebrated Jumping Frog of Calaveras County in the Angel Hotel in 1865. This short story kicked off Mark Twain's career and put Calaveras County on the map. 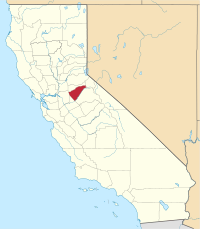 Calaveras County was one of the original counties of the state of California, created in 1850 at the time of admission to the Union. Parts of the county's territory were reassigned to Amador County in 1854 and to Alpine County in 1864. The county's geography includes beautiful landmarks, rolling hills, and giant valleys. It is also known for its friendly communities, and businesses such as agriculture management and construction engineering. It has numerous caverns, such as Mercer Caverns, California Cavern and Moaning Cavern that are national destinations for tourists from across the country. Other attractions include a thriving wine making industry, including the largest of the Calaveras wineries: Ironstone Vineyards, mountain sports recreation and the performing arts. Gold prospecting in Calaveras County began in late 1848 with a camp founded by Henry and George Angel. The brothers first arrived in California as soldiers, serving under Colonel Frémont during the Mexican War. After the war's end, the brothers found themselves in Monterey where they heard of the fabulous finds in the gold fields. They joined the Carson-Robinson party of prospectors and set out for the mines. The company parted ways upon reaching what later became known as Angels Creek. The brothers tried placer mining but soon opened a trading post. By the end of the year, over one hundred tents were scattered about the creek and the settlement was referred to as Angels Trading Post, later shortened to Angels Camp. Placer mining soon gave out around the camp, but an extensive gold-bearing quartz vein of the area's Mother Lode was located by the Winter brothers during the mid-1850s, and this brought in the foundations of a permanent town. This vein followed Main Street from Angels Creek up to the southern edge of Altaville. Five major mines worked the rich vein: the Stickle, the Utica, the Lightner, the Angels, and the Sultana. These mines reached their peaks during the 1880s and 1890s, when over 200 stamp mills crushed quartz ore brought in by hand cars on track from the mines. By the time hard rock mining was done, the five mines had producing a total of over $20 million in gold. The telluride mineral calaverite was first recognized and obtained in 1861 from the Stanislaus Mine, Carson Hill, Angels Camp, in Calaveras Co., California. It was named for the County of origin by chemist and mineralogist Frederick Augustus Genth who differentiated it from the known gold telluride mineral sylvanite, and formally reported it as a new gold mineral in 1868. According to the U.S. Census Bureau, the county has a total area of 1,037 square miles (2,690 km2), of which 1,020 square miles (2,600 km2) is land and 17 square miles (44 km2) (1.6%) is water. A California Department of Forestry report lists the county's area in acres as 663,000, although the exact figure would be 663,477.949 acres (2,685.00000 km2). There are a number of caverns located in Calaveras County. The 2010 United States Census reported that Calaveras County had a population of 45,578. The racial makeup of Calaveras County was 40,522 (88.9%) White, 383 (0.8%) African American, 689 (1.5%) Native American, 571 (1.3%) Asian, 79 (0.2%) Pacific Islander, 1,534 (3.4%) from other races, and 1,800 (3.9%) from two or more races. Hispanic or Latino of any race were 4,703 persons (10.3%). As of the census of 2000, there were 40,554 people, 16,469 households, and 11,742 families residing in the county. The population density was 40 people per square mile (15/km²). There were 22,946 housing units at an average density of 22 per square mile (9/km²). The racial makeup of the county was 91.2% White, 0.8% Black or African American, 1.7% Native American, 0.9% Asian, 0.1% Pacific Islander, 2.1% from other races, and 3.3% from two or more races. 6.8% of the population were Hispanic or Latino of any race. 15.7% were of German, 13.0% English, 10.7% Irish, 7.4% Italian and 7.0% American ancestry according to Census 2000. 94.5% spoke English and 4.0% Spanish as their first language. There were 16,469 households out of which 26.7% had children under the age of 18 living with them, 58.9% were married couples living together, 8.6% had a female householder with no husband present, and 28.7% were non-families. 23.3% of all households were made up of individuals and 10.1% had someone living alone who was 65 years of age or older. The average household size was 2.44 and the average family size was 2.85. In the county, the population was spread out with 22.8% under the age of 18, 5.5% from 18 to 24, 22.4% from 25 to 44, 31.1% from 45 to 64, and 18.2% who were 65 years of age or older. The median age was 45 years. For every 100 females there were 98.5 males. For every 100 females age 18 and over, there were 95.7 males. The median income for a household in the county was $41,022, and the median income for a family was $47,379. Males had a median income of $41,827 versus $28,108 for females. The per capita income for the county was $21,420. About 8.7% of families and 11.80% of the population were below the poverty line, including 15.6% of those under age 18 and 6.2% of those age 65 or over. Calaveras County is governed by a five-member Board of Supervisors. Supervisors are elected by district at the Consolidated Primary Election and serve for four years. Current Board of Supervisors: Gary Tofanelli (District 1); Jack Garamendi (District 2); Merita Callaway (District 3); Dennis Mills (District 4) and Benjamin Stopper (District 5). In January 2019 Jack Garamendi was elected Chair of the Board and Merita Callaway was elected Vice Chair. Manuel Lopez is the interim County Administrative Officer and Megan Stedtfeld is the County Counsel. Both are appointed by and serve at the pleasure of the Board of Supervisors. Calaveras County is in California's 4th congressional district, represented by Republican Tom McClintock. In the State Senate, Calaveras County is in the 8th Senate District, represented by Republican Andreas Borgeas. In the State Assembly, it is in the 5th Assembly District, represented by Republican Frank Bigelow. Past presidential elections in Calaveras County have displayed preferences for Republican candidates; the last Democrat to win a majority in the county was Lyndon Johnson in 1964, although Democrat Bill Clinton lost the county by only 17 votes in 1992. By contrast, recent elections have seen a sharp upswing in Democratic voter registrations. Calaveras Transit provides service in Angels Camp, San Andreas, and other communities in the county. Intercounty connections are available to Columbia (Tuolumne County), Jackson (Amador County), and Lodi (San Joaquin County). Calaveras County Airport is a general aviation airport located just southeast of San Andreas. Angels Camp is the only incorporated city located in Calaveras County. The population ranking of the following table is based on the 2010 census of Calaveras County. ^ a b "Chronology". California State Association of Counties. Retrieved February 6, 2015. ^ a b "Annual Estimates of the Resident Population: April 1, 2010 to July 1, 2016 Estimates". Retrieved April 27, 2017. ^ a b "State & County the population increased significantly in weekends and holidays due to tourism and other events. The population will often double and triple during major holiday weekends. QuickFacts". United States Census Bureau. Retrieved April 3, 2016. ^ Lyman, George D. John Marsh, Pioneer: The Life Story of a Trail-blazer on Six Frontiers, pp. 207-8, The Chautauqua Press, Chautauqua, New York, 1931. ^ Winkley, John W., Dr. John Marsh: Wilderness Scout, pp. 54-5, The Parthenon Press, Nashville, Tennessee, 1962. ^ Thompson, Thomas Hinkley, and West, Albert Augustus. History of San Joaquin County, California, p. 13, 1879. ^ Koeppel, Elliot H. "Angels Camp". The California Gold Country: Highway 49 Revisited. Malakoff & Co. ISBN 0-938121-12-X. ^ "Calaverite: Calaverite mineral information and data". www.mindat.org. Retrieved 25 March 2018. ^ American Journal of Science. (2). xlv, p. 314. ^ "Calaveras County Largest Employers". usaINFO. January 2008. Archived from the original on 2006-05-13. Retrieved 2008-03-10. ^ "California's 4th Congressional District - Representatives & District Map". Civic Impulse, LLC. Retrieved March 1, 2013. ^ "Election Archives". elections.co.calaveras.ca.us. Retrieved 2017-10-21. ^ "Largest Calaveras County Employers". infoUSA. January 2008. Archived from the original on 2006-05-13. Retrieved 2008-03-10. United States Department of Education, National Center for Education Statistics.